This listing is for a Black Celestial Moon and Stars Martingale Dog Collar with a moon charm. The collar slips over your dogs head and adjusts easily to your pups neck size. 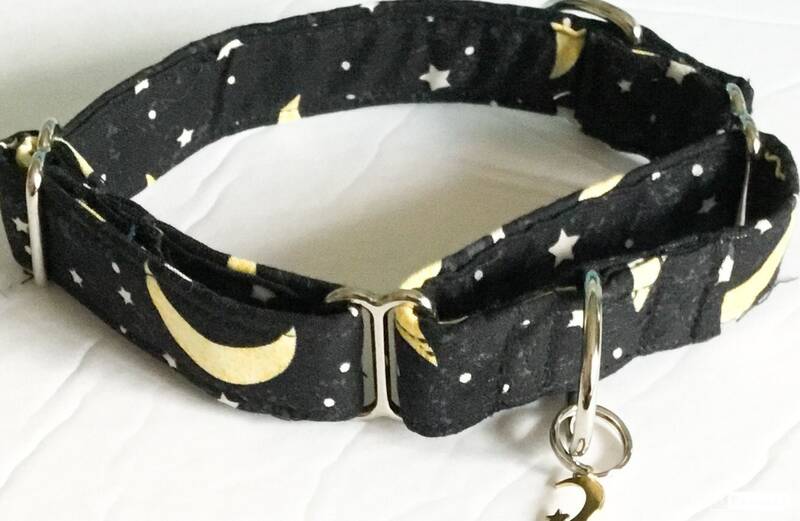 The martingale collar can also be purchased with a matching 5 foot leash, flower, and or bow tie in the options when ordering. The front loop on this collar has a D ring that the leash fastens to when taking your dog out for a walk. The loop pulls the collar tighter around your dogs neck as he or she pulls while walking allowing for better control of pulling. An extra D ring has been added to the main collar section so that the collar can be turned into a regular collar when walking on a leash if you do not worry that your dog will pull on the walk..